88Vape's Mod e-liquids are the perfect product for use with RDAs, drippers and sub-ohm devices. Why choose between pudding and fruit, between sweetness and sharpness, when you can combine them with 88Vape Mod Liquid Lime Zest Cookie E-Liquid? The number 88 may symbolise luck in the Chinese tradition, but there's no luck where 88Vape are concerned. They simply proceed from two key principles: unparalleled pricing and high quality. All their e-juices are UK-made and use 100% organic and natural flavourings. Lime Zest Cookie Mod E-Juice is supplied in 3 x 10ml dripper bottles and is available in a nicotine strength of 3mg. This e-liquid mimics the flavour of melt-in-the-mouth buttery cookies brightened with the sweet yet tangy citrus flavour of fresh limes. Mod Liquid Lime Zest Cookie has a combination of 80/20 (VG/PG) for a strongly-flavoured experience with massive vape clouds. 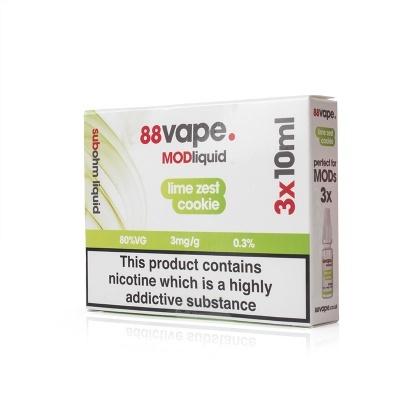 88Vape Lime Zest Cookie is supplied in 3 x 10ml bottles only.